Without AccuBridge, this process would have taken 2 minutes, tops – even with accidentally opening the wrong solution. With AccuBridge, this process took a rather frustrating 10 minutes. I almost forgot what it was I was looking for. Some might argue that I should have just popped over to Windows Explorer and viewed the file in Notepad. Others might argue that I should turn off AccuRev integration in Visual Studio. But, neither of those solutions is optimal: one loses syntax highlighting, the other loses source control integration. It seems to me that the proper solution would be for my source control provider to wait for an explicit command before running off to check the repository for updates. It also seems to me that a plug-in should allow the parent application to close, regardless of what it is trying to do when the end user asks to close the application. Why these things don’t work this way, I do not know. One thing I do know – it would do wonders for my flow. Here's another one of those tips that I'm blogging just so that I won't forget it. 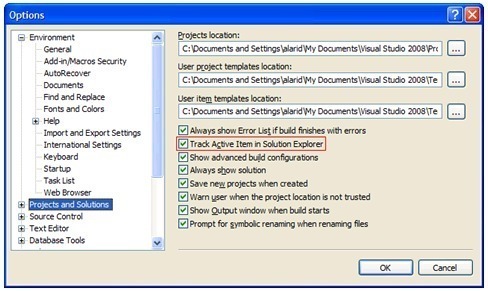 Under Tools/Options, in Projects and Solutions, Visual Studio 2005 and 2008 both provide an option entitled "Track Active Item in Solution Explorer". This option causes Visual Studio to select the active item (current open file) in Solution Explorer. I find this an extremely useful option. It helps me maintain context when I'm jumping from one open file to another while working on a complex problem. It puzzles me as to why the Visual Studio team decided that this option should be off by default. Oh, well. Now we both know how to use it. Visual Studio just went schizophrenic on me: F5 started running File/Open/File, rather than Debug/Start Debugging; F9 refused to toggle breakpoints; and, none of the other default keyboard shortcuts appeared to be working normally. It took me a while to find the resolution to the problem. So, I'm blogging it for posterity. This command starts Visual Studio. Go ahead and close Visual Studio. This command starts Visual Studio again, and allows you to choose your development environment defaults. These commands did the trick for me in Visual Studio 2008. I believe they would also work with Visual Studio 2005, but I have not confirmed this.